Europe in the mid 19th century was shambles. If it wasn’t famine and disease, it was unemployment and insurrection sweeping across France, Germany, Italy and even parts of Britain. America too was effected, the throngs of immigrant refugees upsetting the delicate political balance in the lead-up to the catastrophic civil war that would forever divide the nation. Even a land as far away as Australia seemed attractive to the many disaffected and displaced workers, labourers and peasants who saw little prospect in remaining in the their homelands. Stories of gold and other riches filtered back, spurring waves of migrants to brave the tortuous sea journey where even the fastest clippers could easily take three gruelling months. In the decade between 1851 and 1861, more than 600,000 immigrants landed on our shores, an influx never seen before and largely driven by the lure of gold, discovered near Bathurst in central NSW and later in Victoria. The greatest number of arrivals, in the order of 75 per cent, came from Great Britain. But significant numbers also arrived from Europe and Asia, particularly from China. This varied ethnic and cultural mix created settlements around the country that in many ways mirrored the civil structures these groups had left behind in their respective homelands. Among the most prominent of the time were the Lutherans from Germany, Silesia and Prussia (now Germany and Poland) who settled in the Adelaide Hills and Barossa Valley. What began as a trickle in the late 1830s and mid-1840s became a flood that continued well into the 1860s. Towns like Nuriootpa and Tanunda still bear distinct German characteristics and even a quaint dialect known as Barossa Deutsch. Other pioneer settlements like Hahndorf, near Mount Lofty, and the village of Klemzig in the Adelaide north-eastern suburbs were virtually transplanted from their roots in the former Prussia. From its solidifying period of 1850-60, the German heritage in South Australian is now rich and colourful and easily associated with the cavalcade of excellent wines bottled under such pioneering names at Henschke, Lehmann, Seppelts and Schubert. In Victoria too, the Germans consolidated themselves north of Melbourne. Because of the Anglo-centric history taught in schools for most of Australia’s history, it is only relatively recently that the significance of the Chinese immigrants has gained its deserved attention. By the late 1850s in Victoria, the Chinese community was thriving. 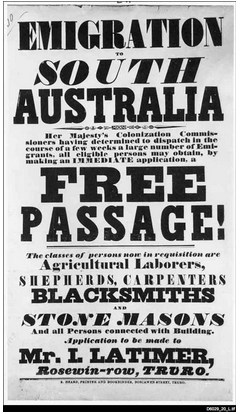 These hard working and industrious migrants, many indentured to greedy labour agents, helped form the colony of Victoria and made up around seven per cent of the population by the early 1860s. Italians, best known for their post WWII migrations, also arrived in significant numbers as early as the 1850s. They too were drawn to the burgeoning goldfields of Victoria with many staying on to create vibrant ethnic communities which persist to this day.